Gee, a circle cutter would sure be handy for that project! I know, but I don't want to dull my fabric cutter! So I traced around a glass with a pencil and cut out each one. Maybe I will make some of these out of felt. Yes, that is my goal. I love it...thanks for posting! These are cute! Not your typical paper ornament! I love these! Is the double-sided tape sticky enough to hold up long term? Also, if your circle cutter gets dulls, you should be able to sharpen it by cutting out some foil circles. Whenever my scissors get dulls, I cut up some foil and they're back to being sharp. Ah! Love these! My first thought (after, "Awe-some!") was, "I bet these would be cute in felt." Be sure to post if you try that! I just found your blog recently and love it. I think these would look cute made into flowers. Instead of making a perfect circle make it wavey and add a yellow pom pom to the middle or something. The possiblities are endless. I love crafts. Do you think all these cute ideas up yourself? What a great brain you have! So cute! we had an ornament just like this growing up, only it was made of foil and pretty garish. My youngest brother loved and it would always put it on the tree, despite all our protests. This is much nicer, but I had to chuckle when I saw it. Maybe I'll have to make him a few with nicer paper options. Great idea! I'll have to give it a try! i believe it's called kusudama. we had an ornament just like this growing up, only it was made of foil and pretty garish. I still have that ornament! I begged and begged my mom for it in the checkout line of the grocery store when I was about 6. She hated it, so I think she was glad when I moved out and took it with me. 30 years later, I still get it out every year! Hee! These are great! I remember making them when I was pretty young but couldn't the pattern again!! Hmm, can I post these on my blog? For right now I am just going to post a link cause I think these are super cool and have many friends who are looking for inexpensive decoration ideas this year!! Oh, what kind of circle cutter do you have? I've been looking at getting one but just couldn't make up my mind. 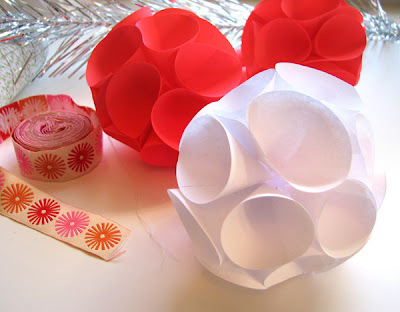 I make tons of stuff using paper, foil, or felt circles but never fabric. 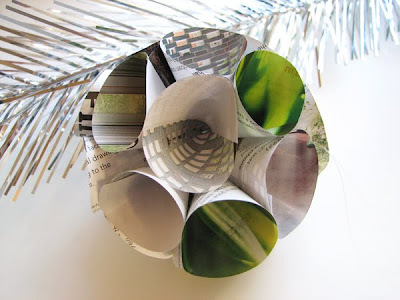 What do you think of making these with fabric that has been stiffen w/ a fabric stiffener? Love it! I'm thinking making 'em with foil paper would be festive. Or with a thin felt and glitter! That's so funny, Kelly! My brother is only 19, so I'm not sure where the ornament even originated from, but its memory lives on forever. My mom had these on the christmas tree when I was little! Bye bye and many compliments!! I am intrigued! Love the look and your tutorial makes it seem quick and easy. Adding it to one of my craft lists. They just keep getting longer and longer. you are so totally awesome. hey...what fabric circle cutter? what is it? where do you get it? I've been looking for something to cut circles from felt foreva. I have this Olfa version right here. Jessica and Grandma G., whoa. thanks. I'm totally gettin that thing. I wish I could find something to cut smaller perfect circles though, like 1 inch or less. My paper punches don't work, not with felt. I looked into getting leather punches but couldn't find any cheap ones. Great idea! Here's an added hint... save those Christmas cards and use them next year for creating these ornaments. I used my CriCut to cut the circles... so they were perfect!! Unfortunately, my gluing and sewing technique left much to be desired.... Mine looks awful!!!! But, it was fun to try anyway!! We used to make huge ones from the pointed cups for soda, and smaller ones from drinking water cups. Saves the cutting and pasting. Lovely idea and very versatile. I put mini cones inside the larger ones with a dab of glue. I think they would look lovely hanging from the gazebo or canopy at a BBQ. I can't begin to thank you for sharing this! 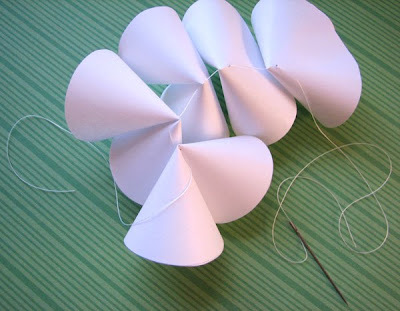 My Nannan showed me how to make them with coloured foil paper growing up and I forgot over the years how to do it. I have been desperately looked for something similar every Christmas season. Sure thing! I found the directions in an ancient craft book from decades past. Thanks for posting the directions for these! They are so cute! I just gave them a try, but I can't seem to get the final knot tied close enough and tight enough to the center, so my ball flops around too much. Any tips on tying the final knot? Thank you! My Big Shot machine has circle dies with scalloped edges. Also, I have a clear circle die. It would make short work out of circle cutting for this lovely project for sure. Here we go again. Needed a last minute ornament craft and this was perfect! Came out really cute, but I have no idea how I was supposed to tie it off, so I twisted the thread around a bunch. I hope it holds!